Ever since Aaron and I were introduced to the possibilities that points had to offer, we've been able to go on several vacations for free or nearly free. Seriously, we just paid our bills and made our money work for us. I love sharing travel secrets in hopes of helping others enjoy the same experiences that we've enjoyed! (Check out the other posts on the Southwest Credit Card and IHG Rewards Club Credit Card for help with free flights and free hotel stays.) 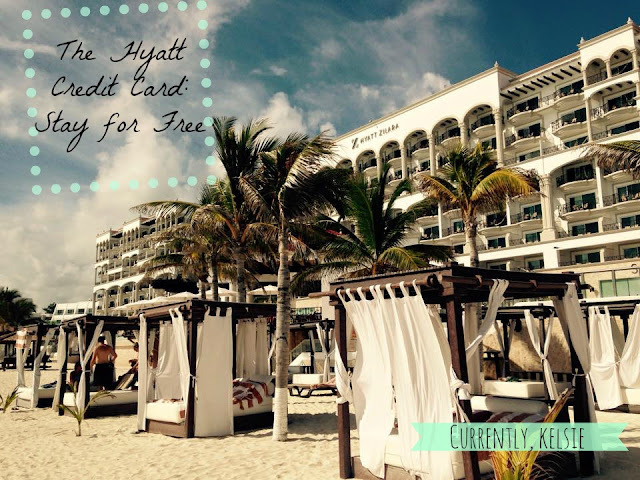 So here's my third installment of travel tips, this time with a focus on The Hyatt Credit Card. The Hyatt hotel group includes all of the following hotel types: Hyatt, Park Hyatt, Hyatt Regency, Hyatt Place, Hyatt House, Hyatt Centric, Grand Hyatt, and Andaz. Their rewards program, the Hyatt Gold Passport, is free to join, and you are able to redeem points worldwide. The program allows members to earn points for dollars spent on hotel rooms, as well as at their spas and restaurants. There are also some car partnerships available, but the easiest and fastest way to earn points is with their Hyatt Credit Card. Every dollar you put on their credit card will count as a point, or two or three, depending on what you're buying. More on that below. You apply for the card. Once you are approved, you have to spend $1,000 within the first free months. This spending amount is fairly easy to reach, if you put groceries, gas, and your bills on the card. 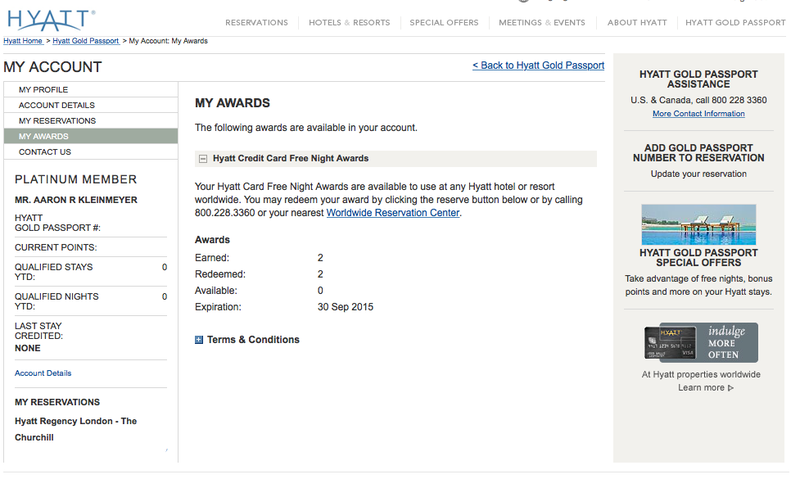 Then, rather than tons of points, Hyatt awards you two free nights anywhere in the world at any of their hotels. This includes the all-inclusive hotels (Hyatt Zilara in Cancun and Hyatt Ziva in Jamaica) or any of the highest categories of hotels. This offer is good every two years, which is something to keep in mind if ever re-applying. Amazing! Two free nights at any hotel anywhere in the world. You can save a ton of money here alone. One free night at any hotel category 1-4 after your cardmember anniversary. No foreign transaction fees (so it's a great card to use abroad). 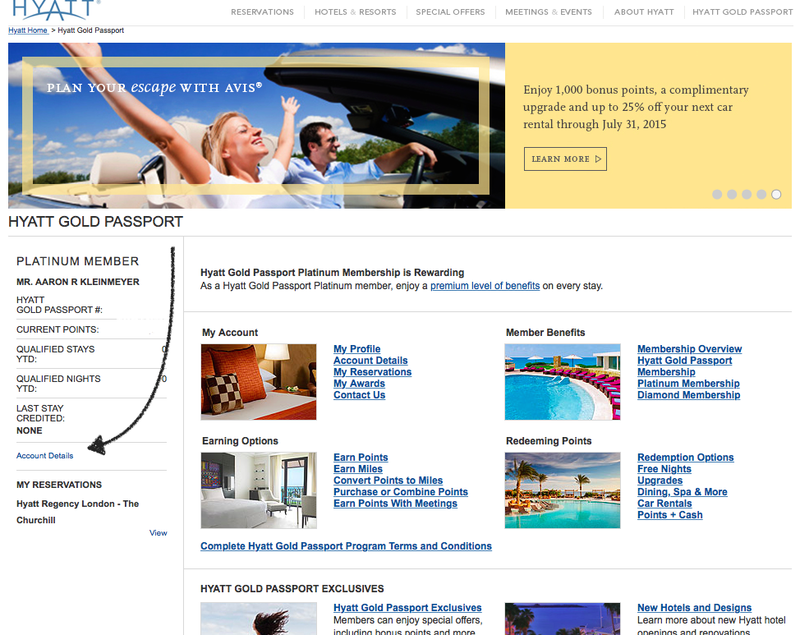 Hyatt Gold Passport Platinum Membership. This gets you complimentary internet and late check out, as well as other benefits like a 15% bonus on your eligible spending points. Earn 3 points per dollar at all Hyatt properties, 2 points per dollar on all restaurants or airline tickets, and 1 point per dollar on everything else. Chip enabled, which helps with foreign transactions and security. $0 Introductory Fee, $75 dollars the second year (which more than pays for itself). 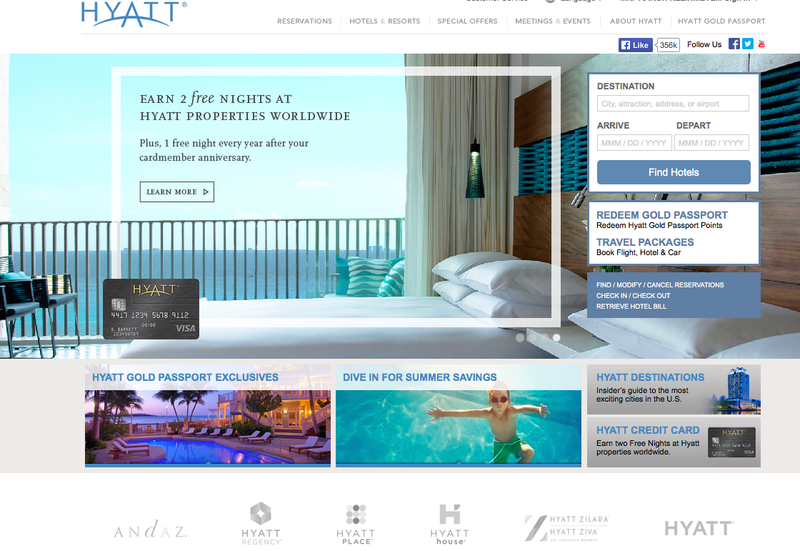 The Hyatt website, http://www.hyatt.com, is easy to navigate and is fairly straightforward. 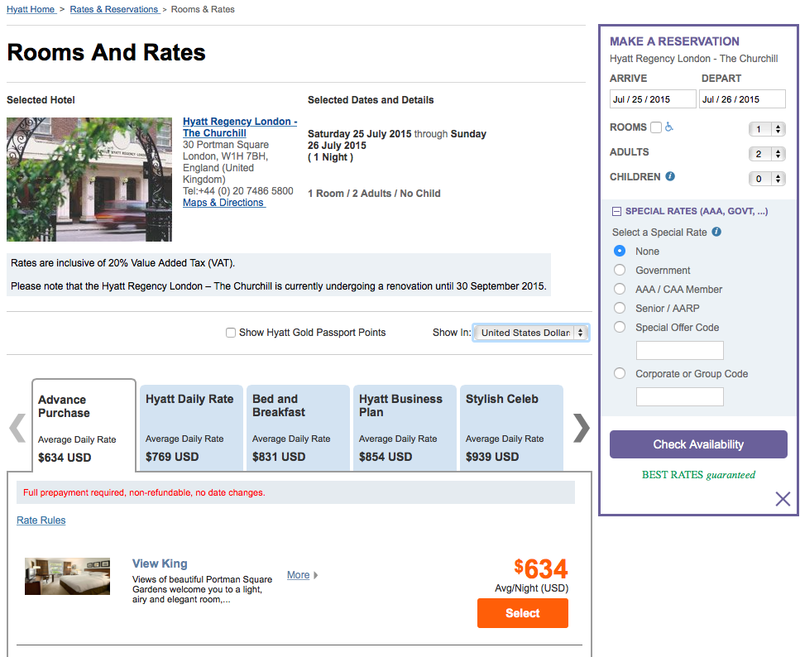 There is an option to select when searching rooms that says "Show Hyatt Gold Passport Points". When browsing, you would want this to be selected. However, when booking rooms with points or using your free nights, you will need to be logged into the Hyatt Gold Passport site (shown below). Once you create your gold passport account (or the company assigns you one when you get the credit card), you will be able to log in. By clicking on redeem points, you'll be able to see the points needed for various tiers of rooms. When you click on free nights, it will show you the amount of points needed for a free stay at any Hyatt. But the most important part of this page is the account details. Click there. This will take you to your account, so that you can book those free nights that you earned just by spending $1,000 on the card. You can see below that Aaron had two free nights, and that we've redeemed them both. When your two nights show up next to "Available", then it takes you to a screen where you search for and then book your hotel. For free! It's as simple as that. You used to have to call, and you still can if you want, but it's super easy to reserve online. Note that the reward nights can fill up at the best hotels, so try to plan ahead as much as possible. Or be patient and keep checking for availability. The screen you'll access to book your free nights. This card has been amazing for us! We each got one last year (earning a total of 4 free nights), and we used three of the nights towards our free all-inclusive New Year's trip to the Hyatt Zilara in Cancun. 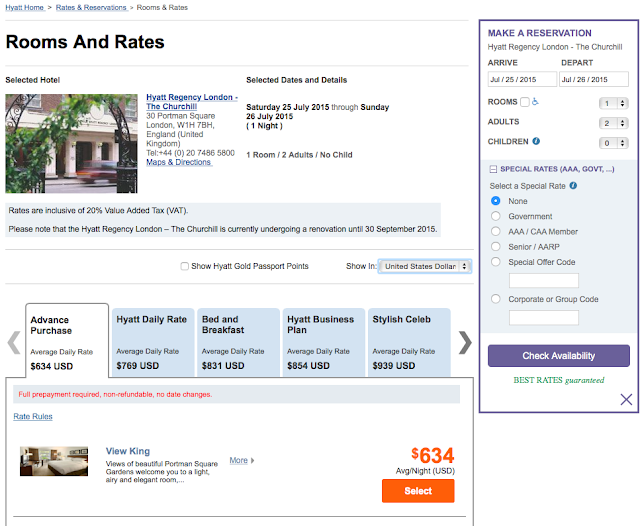 To put this in perspective, one night at the Hyatt Zilara would normally cost over $1,000. We got it free (plus unlimited food and drinks). For more on that amazing trip, check out this post. Since we still had one free night left from our card, we hoped to use it on our trip to Europe this summer. I searched, and the hotel that we wanted in London wasn't available for a reward night, but I checked back a few weeks later and it was! So we are getting a night at this hotel, which should cost $634, for free. Yep. Saving so much money on a Saturday night in London. And we will each get another free night on our card anniversaries! We love getting free nights at amazing hotels like this one. We're staying at a hostel the night before. No biggie. Ready to Get Started? To apply for this card, check out this link. Still have questions? I would love to tell you more about our experiences or answer any questions you may have. Click here to contact me, or comment below. If you liked this post, and want to be updated when new travel tips or posts are shared, click here to sign up for the newsletter. Happy travels! I'm linking back to The Shabby Nest. That is pretty darn cool! I love cards that give you great perks like this! :] Yay for an excuse to travel! Farrah, it's definitely a perk! Makes me happy to know that the money I'm spending on necessities is helping me travel :) Thanks for reading! What a great way to see a reward on the money you already have to spend on the necessities in life. I call that money well spent. Agreed, Jccee! It's great because we aren't just spending extra money just to travel. We're spending money on the things we really need...and then we get to travel free because of it. 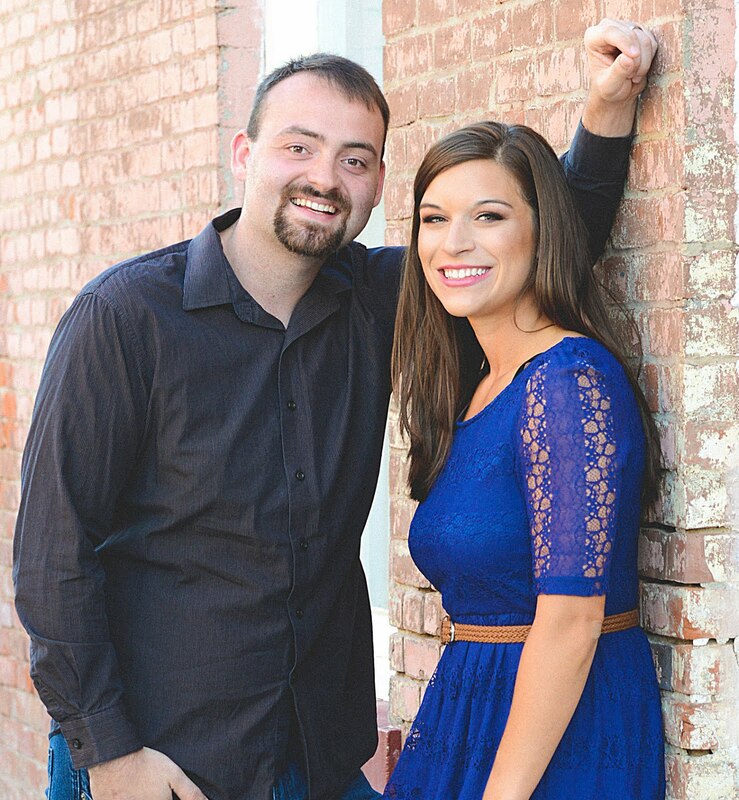 It's been a really exciting way to make travel a possibility for two young married teachers :) Thanks for stopping by!